I want you to meet a young prayer bead maker, Andrea Cueva, the 17-year-old daughter of my friends Kathy and Bob Cueva. I have known the Cuevas for about four years, since I began working on the book Fabric of Faith, which was about Prayers & Squares, the prayer quilt ministry. Kathy is the president of Prayers & Squares. 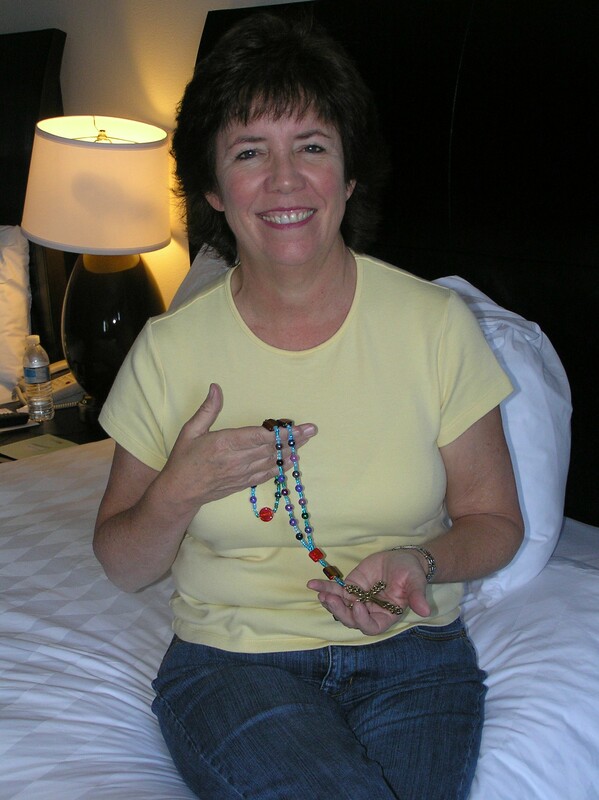 Andrea got a look at Kathy’s copy of Bead One, Pray Too and she hasn’t stopped making prayer beads since! One of the first sets she made was this one for her mother. A very special set, indeed. When I saw Kathy in Dallas at the Prayers & Squares National Conference, she told me how Andrea is making so many sets of prayer beads – and other beaded items and collage and photography – that they are considering converting the family’s spare bedroom into a studio for her. Andrea would like to study photography in college and she has taken pictures of her prayer bead creations for her portfolio. She invites you to view her photography at her website. Kimberly: What made you want to start making prayer beads? Andrea: I’ve always known about rosaries and such, but when my mom came home with your book and I flipped through it I realized just how easy they would be to make. When I found these black velvet beads at Michael’s, I jumped. I loved the feel and thought how nice it would be to pray with those. K: What kinds of prayer beads do you make? A: I don’t know what category of prayer beads mine would fall under. Also, I’m not Anglican or Catholic, I’m Methodist. Personally, I make them how I like them, just like I have my own individual relationship with God. 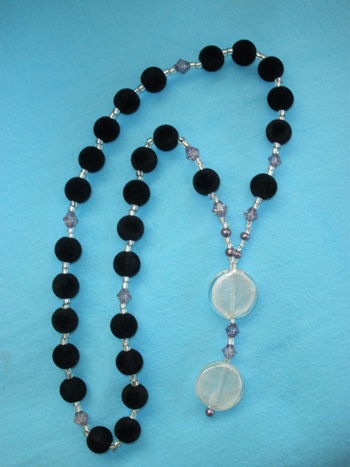 I think if someone is going to make prayer beads, they don’t have to follow any pattern but their own. I mean, don’t get me wrong – a lot of people love patterns, and they’re a really good starting tool, but I’ve been making jewelry for a long time so I usually don’t follow patterns. K: Who have you made prayer beads for and why? 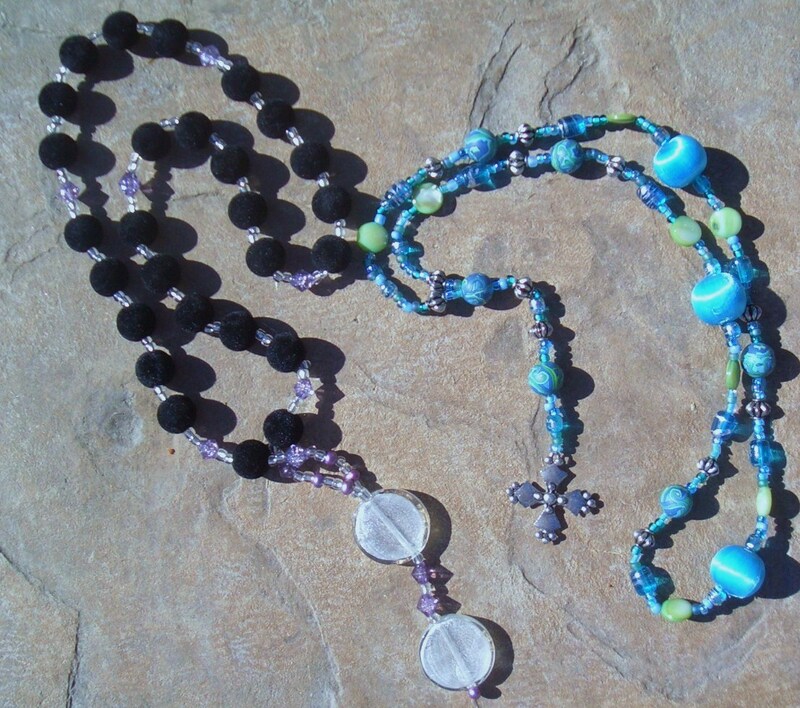 A: I made prayer beads for my mom first. She came home with the book, and the patterns, and the beads that she specifically wanted. I followed the pattern and made them for her in a jiffy. I also had my own beads ready, so I decided to sit and make my beads then, too. While making them I prayed on and off, but what I enjoyed most was the idea that I got in the middle of making them – I decided to make a ton of similar rosaries and to layer them on a canvas. The end product? 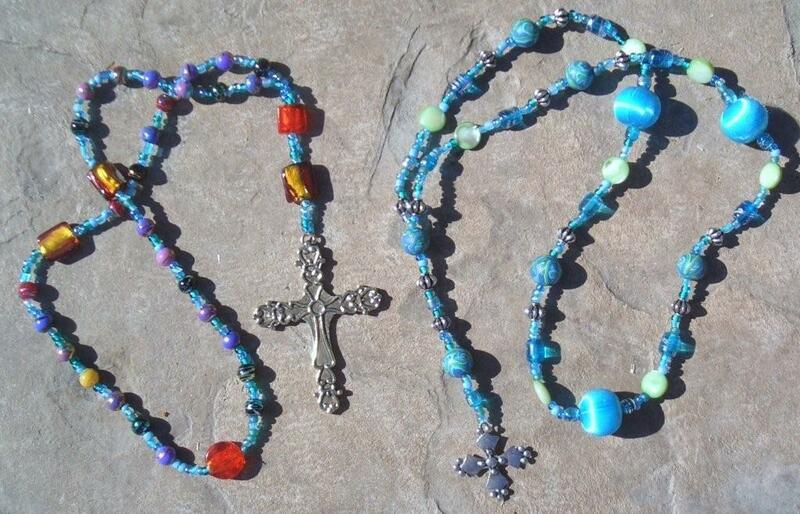 A collage of rosaries. I’m starting that project this weekend. And I think I might start making a rosary a day. I think it’d be pretty cool to look back at the end of a year and have pictures of 365 prayer beads. K: What do you think of or do when you make prayer beads? Do you pray first or while you are beading, or just sit quietly and make them? Do you listen to music? What kind? How does all this help you make the beads? A: Well when I was making my first rosary I was listening to Enya. Her music is really soothing and perfect for a prayer-filled environment. Personally, I could listen to practically anything and pray, but for the more seriously spiritual I recommend Dido, Enya, Enigma, or any simple classical music would suffice as well. I like mild multi-tasking when it comes to being crafty. At the very least I always have music on, but each person’s environment is truly their own preference. K: Do you use prayer beads? Tell me how and why? A: I do use prayer beads. The black ones are my personal ones (see second picture). I usually pray when I’m falling asleep and I hold my beads while I do so. The velvet beads are almost comforting to touch, so it’s nice and easy to fall asleep in a peaceful, prayer-filled environment. When I feel like I’m about to drift off to sleep I hang my beads back up next to my bed until I use them again the next evening. K: What prayers do you say with them? A: I don’t pray about anything specific. I mean, I don’t sit and say the Lord’s Prayer or sing hymn or anything. Usually I ask Him for strength in a situation I’m in, or the right words to deal with something. I mean, I am in high school, there’s drama apart from normality. I’m a very passionate person, so when I get mixed up in stuff, I either ask God for the strength to get out, the strength to help others, or the right words to end the drama. That’s in most cases. If there’s anyone in my life that is ill, etc., of course I pray for Him to watch over them. I also really try to pray for the troops in Iraq.